Thank you for your immense support towards the Spectrum Enrichment program currently located in Steveston Secondary School. The petition has been submitted last Wednesday (January 17th 2007) And at that time, there was more than 130 Signatures (with over 100 signatures in the first 6 hours of posting). The staffadministration vote had over 70% in support of continuation of this unique experience. PS: Special thanks to all the helpers in promoting\spreading the link (it was top in google if you searched Steveston Spectrum!). A very special thanks to RL, KL, VY, SK, RT and anyone else that helped me out. You know you are. As many of you already know, Steveston secondary school is closing down beginning September 2007 and is merging with the existing Charles E. London Secondary School to form Steveston-London Secondary School (or SLSS). One issue in hot debate is whether or not the enrichment program Spectrum currently offered in Steveston is going to be continued in the new school, since London does not have an enriched program currently. As a student in the program and will graduate by June 2007, my point of view stands with least bias, as whether or not the program will continue will not affect me in the future, as well as the fact that I have first hand experience towards the program and the offerings and experiences Spectrum has offered. I feel Spectrum is indeed a worthwhile program since the program provides a positive environment where students may excel better at core subjects. Since most students are capable in motivating themselves towards achieving academic excellence, the teachers may spend less time on some parts of the curriculum. 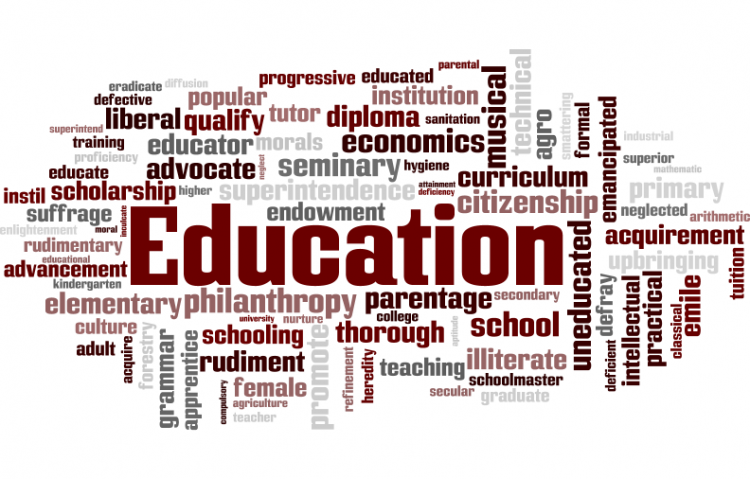 Some people may say that only a select group of students are getting the better of all education, however, this is not the case as the teachers are essentially the same, as many of the teachers teach other classes in the same grade as well. Also, the core subjects are taught over a longer period of time-over the span of 10 months-instead of 5 months of the same subjects and not having that course until the next school year. Spectrum also establishes a friendly learning environment for the students to be comfortable in achieving more and spending less time getting to know new people-which results in barriers or conflicts between peers. Some may argue that this is not a benefit-however; I think that the other two blocks Spectrum students spend outside of Spectrum in one semester allows plenty of time to meet new friends and acquaint with them. Spectrum also provides an annual trip to various outdoor locations located in North America for students to get acquainted with the nature side of education-thus providing a more complete understanding of the world around us. Outdoor education allows students to gain first hand experience in topics that may not be taught within the school system. Although many students and parents think that Spectrum students are naturally better and more superior just because they are in Spectrum. This is not true either as Spectrum students, as mentioned earlier are only more motivated to do their work, not because they are any better or superior than anyone else. If the Spectrum program is to be eliminated to the near future, many questions are to be raised. For example, Basketball teams in schools are limited to around one dozen students. Typical tryouts have a turn out of 2 or 3 times the amount that they can accept-thus they must cut down and disappoint 20 students. Should Basketball teams be eliminated from the school system as well? Lastly, if the consensus is clear, the teachers, staff and administration should follow what the public wants-regardless of their own view of this issue. One purpose of an educator is to give the most unbiased information to the student. An analogy we can use is the restaurant, if the restaurant serves bad food, no one would come back and soon enough, the restaurant would be out of business. In the same sense, the school is like the restaurant and the students are the customers, we as a public school should offer variety of choices to all students-allowing them to choose whether or not they participate in the enrichment programs-otherwise, students may just attend another school with enrichment programs instead. We, the undersigned, Request that the enriched program 'Spectrum' be continued, regardless of the teachers decision-if the public consensus is clear that they want the program back to continue. 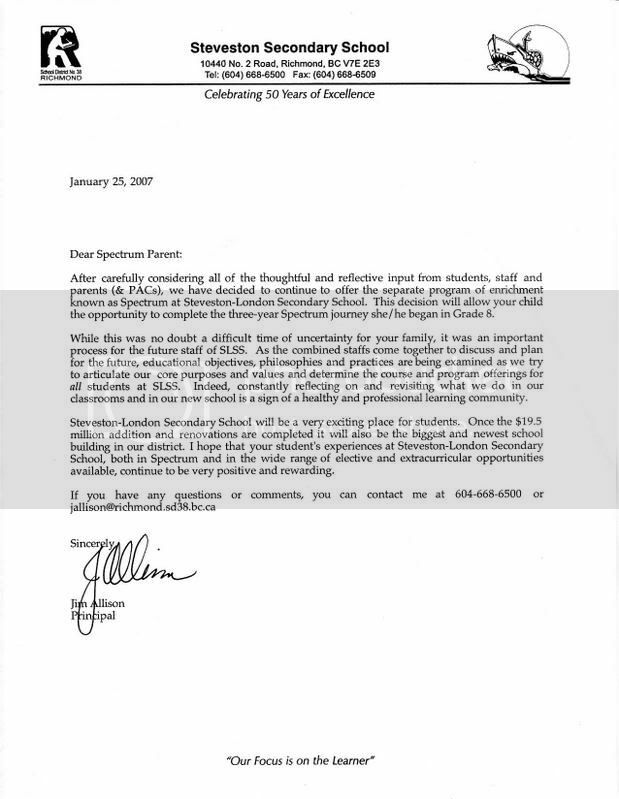 The Keep Spectrum Enrichment Program Alive in Steveston-London Secondary petition to Administration and Staff of Both Schools (Steveston Secondary and London Secondary School) was written by SpectrumProgram and is in the category Education at GoPetition.